Own a piece of the Philadelphia Phillies hallowed ground! Literally! 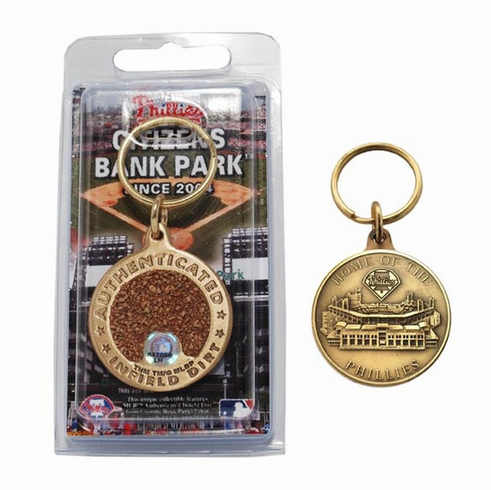 This unique minted Coin Keychain has Infield Dirt from Citizens Bank Park embedded in the center! Each is labeled with a numbered MLB Authentication Hologram confirming the Infield Dirt was retrieved from the Stadium and embedded in the coin under the watchful eye of an MLB representative. The other side of the Coin Keychain is minted with your favorite team's Stadium. Each coin key chain is delivered in a custom clamshell package (image on insert subject to change) and each is officially Licensed by Major League Baseball.